When the BCRC was renovated a couple of years ago, we had to give up the room where we'd had a coffee maker. I tried using the café one floor down, but they were closed at inopportune times (like "summer" and "holidays" and "night"). So I ended up getting a Keurig coffee maker. I was skeptical about the Keurig model -- indeed the inventor of the Keurig system regretted creating it. At home, I won't use one -- I much prefer to having a pot of coffee and being able to just pour myself a cup. But, without a sink to easily clean and fill a coffee pot, the Keurig is a necessary evil. My colleague and I often try different kinds of coffee. (Usually whatever is on sale from week to week). 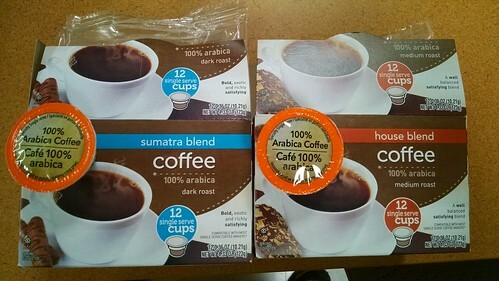 I often get the inexpensive grocery store brand of coffee — which has many varieties. I noticed, however, when I recently went to switch from one variety to another, that although the boxes are different, the "pods" instead look identical. And I wondered if they were really different. This morning, I can attest that they are, in fact, different. Quite different. And that this one (the "house blend") is extremely nasty as compared with the Sumatran. I won't be getting this one again.